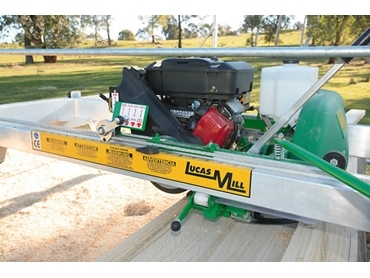 An expansion on the previous 6-14 model, 6-18 circular swing blade portable saw mills from Lucas Mill feature an 18 horse power petrol engine, with electric and manual start options. Designed to suit the harvesting of both hard and soft timbers, these portable saw mills can be operated on any terrain, and are supplied standard with a side shift winder to facilitate easy horizontal movements of the power head. Standard track extensions are also included, providing for an overall cutting length of 6.1 metres. A five tooth TCT 2.8mm plate saw blade provides the cutting mechanism. With a comparatively light operating weight, model 6-18 portable saw mills are well suited to use by medium sized operators.